Brief：Five Chinese companies will start operations in Abu Dhabi's industrial zone with an initial investment of $300 million in a boost for the oil-rich emirate's economic diversification plans. Sultan Ahmed Al Jaber, UAE Minister of State, shakes hands with Huang Lixin, Executive Vice Governor of Jiangsu Provincial People’s Government, signing ceremony for UAE-China industrial capacity cooperation in Abu Dhabi, United Arab Emirates July 31, 2017. Five Chinese companies will start operations in Abu Dhabi's industrial zone with an initial investment of $300 million in a boost for the oil-rich emirate's economic diversification plans. The companies, from Jiangsu province on China's east coast, are involved in sectors ranging from power and metals to natural resources and banking, Abu Dhabi officials said. Chinese companies are increasingly seizing opportunities in the Gulf as the Asian economic giant seeks to expand overseas with its ambition to rebuild Silk trade routes. 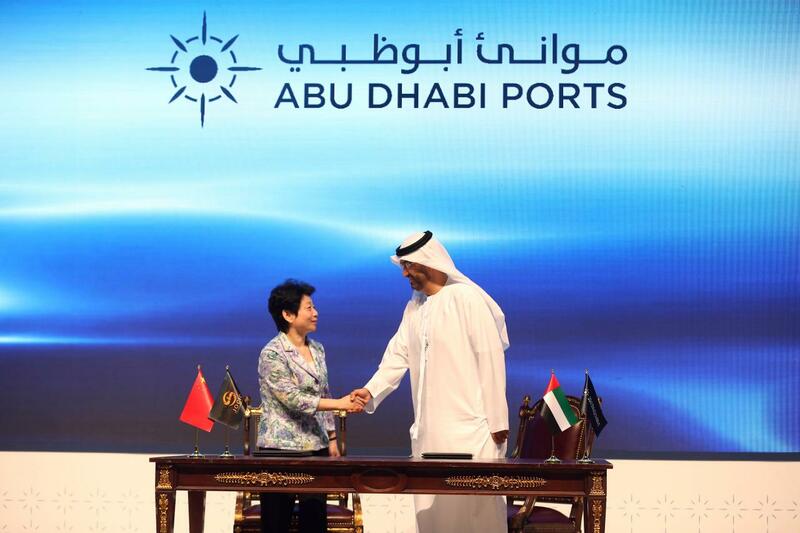 Abu Dhabi Ports has signed a 50-year agreement with the Jiangsu Provincial Overseas Cooperation & Investment Company (JOCIC) to take a lease on 2.2 square kms (0.8 square miles) at the Khalifa Industrial Zone Abu Dhabi (Kizad), Mohamed Juma al Shamisi, chief executive of Abu Dhabi Ports, told Reuters. JOCIC will in turn sign separate agreements with the five Chinese companies, he said. The firms are Hanergy Thin Film Power Group, Jiangsu Fantai Mining Development (Group) Co Ltd, Xuzhou Jianghe Wood Co, Jiangsu Jinzi Environmental Technology Co and Guangzheng Group. Abu Dhabi Ports Co manages Kizad as well as the ports in the emirate. "The foreign direct investment into industry will contribute positively to Abu Dhabi's non-oil GDP and help in diversifying the economy from oil," al Shamisi said. Last year, China's Cosco Shipping Ports Limited won a 35-year concession to build and operate a new container terminal at Abu Dhabi's Khalifa Port in the capital of the United Arab Emirates. Cosco, at the time said it planned to invest over $700 million.